It’s time… don’t you think?! A day for the Galgo! This has been an idea we have had for some time but it’s always been pushed to work on more pressing things, like saving these amazing dogs! We are so proud that we have finally been able to launch Dia del Galgo | World Galgo Day. We are working on additional languages and hope to have those ready so you can share, but it’s been a lot of work, so please bear with us. This day has such a significance for two reasons. One, it marks the end of hunting season and we know what consequences confront us with this annual tradition. And two, we want all those in Galgo rescue to unite and be stronger together. Now with the power of social media we have the ability to harness our emotions and put them to work even if we are not standing on the ground in Spain. We ask that everyone download one or all of our tools that have been provided on the website. Now and on February 1, we want Facebook and Twitter etc., to be plastered with Dia del Galgo. Be a voice for the Galgo. They need us and together we can make a difference for them on February 1 and every day of the year. Being in North America and rescuing dogs from Spain, we always get the question, “Why Spain? Aren’t there dogs here that need to rescued?”, and we always answer, “Yes! of course!, but Spain is different.” And we go on to explain the situation. It was late in the day, the sun had already set. 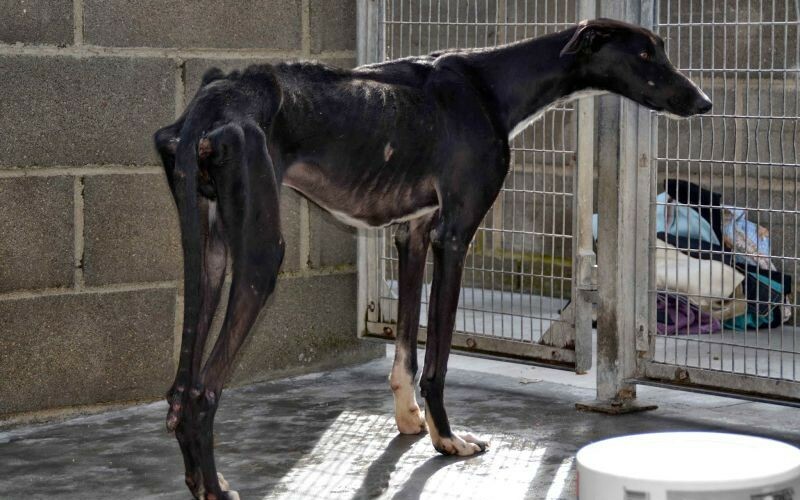 A man showed up at the shelter with a male Galgo probably about 18 months old. The man didn’t want him anymore and wanted to know if we could provide him with another. Of course we said no but he handed over the dog anyway. The Galgo had a piece of twine around his neck that doubled as a leash and a collar. He was terrified. I escorted him to a kennel where he could settle and I told him that he was safe and he never had to be fearful again. A half hour later, the man returned with his paperwork to sign over the dog, but also returned with his young daughter who was crying for the dog, so the man said “give me my dog back”. We had no choice but to give him the dog. He had not signed the dog over to us yet. I had to walk back to the kennel, literally pull this dog out and hand him over to this horrible man… after I promised him that he would never have to fear again. I broke my promise and it still haunts me to this day. What happened next broke my heart and stayed with me forever. The man took the Galgo and put him in the trunk of the car … it was a sedan… and dark trunk of a sedan…and left with his daughter. I will never, ever in my entire life forget that experience. I have no idea what ever happened to that dog. Maybe, eventually he ended up at Scooby… this is all I can pray for. But the reality is, some of these people don’t think like normal compassionate people. It can be as extreme as hanging them or simply just tossing them in the trunk of the car. That’s “Why” we rescue dogs from Spain. And they need us now just as much as they did 10 years ago. Things have changed a lot over the last 10 years in Spain. Scooby has many Spanish volunteers at the shelter now and way more local adoptions of dogs, but the reality is… Galgos are still used as tools and left for trash after hunting season. Please share the story of the Galgo and how Scooby is working hard to make a difference for them.